Next month, October 11 to October 13, Technical Packaging Systems will be giving customers the chance to explore stretch wrapper options firsthand with our Lantech Truck Blitz. Loaded up with the company’s Q400XT with the “EZ Scale” and “Click-N-Go” upgrades, this is an excellent opportunity to learn about advancements in stretch wrapper technology, as well as see these amazing pieces of equipment in action. During the event, our staff will be on hand and prepared to answer any questions that you may have about integrating new stretch wrapping equipment into your operation, such as our equipment’s production speeds, maximum load weights and wrap forces. 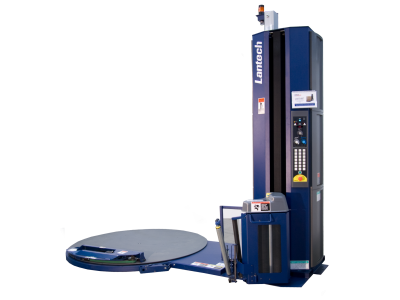 The Lantech Q400XT is one of Technical Packaging Systems’ most advanced stretch wrappers. Offering a wealth of optional upgrades, including a ramp, forklift stop, extended wrap heights and integrated scales, the Q400XT is perfectly suited for high-production shipping and is designed to work harmoniously with several other products available from Technical Packaging Systems. With standard, built in pallet grips, Intelli-Sensor and EZ Thread Film Discovery, the system is ideal for anyone that is looking for ways to improve their production line and optimize efficiency. As the primary distributor of Lantech machinery in Michigan, Technical Packaging Systems is the area’s go-to provider of the industry’s best stretch wrappers and material handling equipment. Headquartered in Kalamazoo, Michigan, we have proudly sourced, installed and configured a wide range of packaging and material handling solutions to countless industries. Our knowledge and expertise puts our customers in an advantageous position, allowing them to source machinery from Lantech, the best stretch wrapping equipment available, and have it installed by our technicians, the most experienced team around. If you’re looking to boost your productivity and streamline your production line, be sure to schedule a visit from us during our Lantech Truck Blitz, October 11 to October 13.